6 Steps to follow while making Financial Goal ! also very important like your life goal. "Why it is important to make Financial Goal ?" Financial Goal is main part of Financial Planning every Financial Planner suggest to list down their goals and than once can make a comprehensive Financial Plan. Prepare a list of financial goals. It can be any requirement like Buying Car , Home, Child Education, Child Marriage, World Tour, Retirement etc . Along with this there must be a very clear timeline associated with the Goal. Something like “I want to buy a Car after 4 years , which will cost 8 Lacs at that time” . 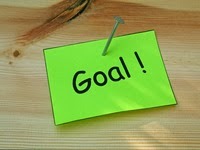 Goal must be written because without it is difficult to remember all the things. Second things to be done is investor should make it with proper planning. Plan must be make to follow your goal like " How much money you should invest monthly or lump sum investment or any other option" This step is very interesting and will make you aware a lots of dream come true on paper. First of all your past investment should be link with your investment while you make a plan and also attach your future investment plan you are going to start. After doing this step you can clear about your future goals and your current investment. Although this will make your all financial goals on one sheet where you can see it periodically at what level you are in future. After all this depends on investor to stick your goals till you reach your destination within time. It is very difficult to stick for long term because investors are doing all the things well and agree to do all well when some circumstances like "Market fall or rise, News or Rumorers ". So you need too much passion to stick to your goal. It is your advisor job to check your investment periodically and it is your job to check your goals achievement periodically. Every investors should keep in mind that Goal can be change or can be modifies in some situations like "lost of job, Early Retirement, Business Slowdown etc." Finally you Achieved it!!! This can be done only when you follow all the steps carefully. The happiness of achievement of any financial goal will be similar to other goals but you have to care and follow your dreams. Wish you all the best for your all Financial Goals!! !